There are way too many good food blogs out there and I just can’t keep up anymore! I follow some of them pretty regularly as they appeal to me for various reasons. Cynthia’s lovely blog, Tastes Like Home, is one of the blogs I like to frequent. Her writing, her recipes and her photos always make me go back for more. Her blog truly is a visual delight and her warm personality comes through in every post that she writes. I had never actually cooked from her blog, so when Zlamushka announced the Tried and Tasted event earlier this month and decided to kick things off by showcasing Cynthia’s blog, I was only too happy to participate. I dug deep into her archives and found just the thing I was looking for- a dead simple recipe that called for only 2 ingredients- cheese and pepper. Here is the original post. Grate a small wedge of parmesan cheese using a box grater into a bowl. Add pepper. Mix. Place about a tablespoon of the grated cheese onto a silicone or parchment lined baking sheet (I used a baking sheet lined with aluminum foil) and lightly pat down with the back of a spoon. Repeat with the remaining cheese, spacing the spoonfuls about a 1/2 inch apart. Bake for 3-5 minutes or until golden and crisp. Carefully peel crisps from foil. Cool. Serve with mango salsa. The crisps can be used as an appetizer with a dip, on top of salads or even in a soup instead of croutons. I also tried making Parmesan cups. I had seen Giada make these on one of her shows a few months back. I spooned the cheese onto the baking sheet and pressed down gently to flatten out the mound. I baked it for a minute or two till the cheese melted and started to bubble. This was quickly removed from the oven and transferred (this has to be done very fast or else the cheese starts to harden and molding it becomes impossible) to a mini muffin pan and molded into the shape of a cup by gently pressing down with fingertips, also using a small spoon for help. This was then cooled until it hardened. I made a few cups like this. 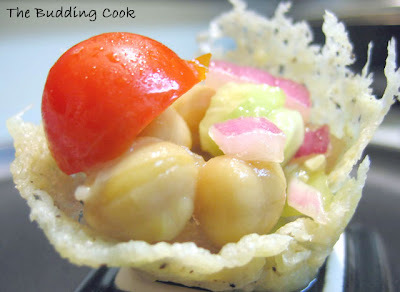 I had prepared a chickpea salad yesterday which we had in these cute little Parmesan cups. In a bowl, combine everything. Serve chilled with parmesan crisps or spoon into cups. The above picture would be a good fit for Click: Cheese. Thank you for the idea, Purplesque! A fine choice to try! If I had noticed that one, I very well might have picked that recipe to submit to Zlamushka's event. Your serving suggestion is fantastic. I know what you mean about there being almost too many good blogs out there. I can't keep up either. You are so right about Cynthia's blog. 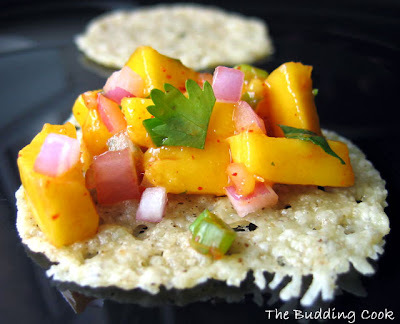 How simple and elegant is that recipe.. beautiful and that mango salsa is out of the world. Almost 99% of the mangoes I buy here are a disappointment... :( How do you pick good ones? hi tbc,first time to ur blog.gr8 recipies. The cups looks absolutely adorable. Wow...this is so creative and it looks yummy! So simple, yet elegant. The cheese, pepper and flavours of your salsa should tatse wonderful. Like reading Cynthia's writing. Have cooked up something from her blog, too. I totally agree with you about cynthia's blog, i love visiting her place. TBC, you alws post such mouth watering pics..new to me..the salsa looks yum!! Tks for sharing! Yum Yum Yummy chips TBC.. esp love the last pic! what a beauty tbc. i dont remember seeing it at cynth's blog. thanks for posting it. wow, those cups are sooo cute. I can tell they tasted great. I also tried one of Cynthia's recipes. She sure have so many yummy recipes. tbc - those are absolutely fabulous!! i've seen the parm. crisps in lots of books and tv shows, and heard about the cups and haven't made either. :( i just have to do it!! these look so good! Oh i love parmesan crisps, looks very tempting. Very nice recipe for mango salsa, looks colorful, great entry!!! 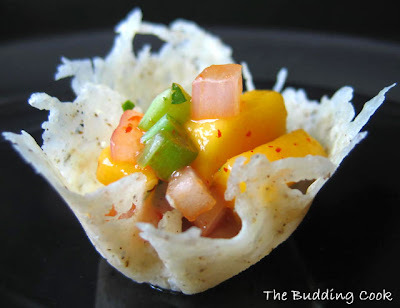 Parmesan crisps with mango salsa looks like a great snack. Those look like a great touch to add to any meal--garnish, cup, scoop, etc. I'll have to give that a try! I've seen cheese crisps used in salads. Nice idea to top with with intersting foods. Love the little cup and the contents! TBC, your creation looks wonderful! I really appreciate your comments on my blog. Please stop by again as I have left something for you there. The last pic is gorgeous! Parmesan Crisps sound good and pairing them with mango salsa is a great idea. You have made such beautiful creations! I wish I could have some. I will definitely try it with your fillings. 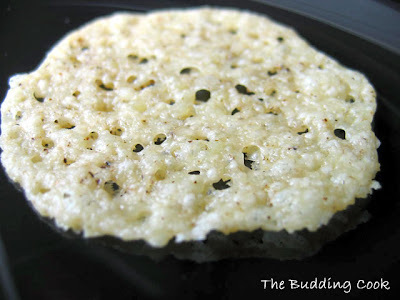 Wow...these parmesan crisps look really simple & yummy..
thanks so much for submitting this to TasteSpotting! If you wouldn't mind re-submitting the photo without the watermark on it, we'd love to publish it to the front page! I have to try this... those salad cups look so cute. I am planning on making a post on what I consider to be the most original food photos of the last month(s). I will be posting the 10 photos on Culinarty (my blog) with a link back to the authors. I really like the last pic and I would very much like to include it in my post. Would it be ok with you? Mango salsa in parmesan cups! I am absolutely drooling out here..